The Jet Chef (JT 369/WH) microwave oven looks and performs like a best-in-class traditional oven, but with Whirlpool’s exclusive 6TH SENSE technology, it also offers you a lot more- combining quality and variety with incredible speed and remarkable ease-of-use. 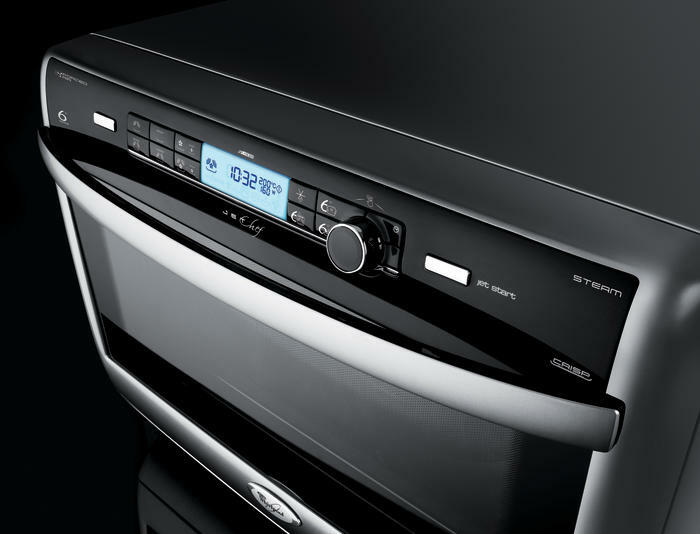 6TH SENSE controls and monitors the cooking process for you, defrosting, cooking, crisping and steaming at the touch of a button. Jet Chef is available in white or silver finish. Post a comment about your favourite ‘Sugar ‘n Spice recipe and you could win this amazing Whirlpool Jet Chef valued at R4000! Winners will be announced on the 30 May 2013. LOL Maymoona….great to hear from you! I have tried the red velvet recipe and it was just to die for! Love it! Have been looking for a “fondant” chocolate volcano recipe for a while. Have used lots of your recipes before so I know this will work out just fine. Think I will surprise my hubby tomorrow night. Just started to follow your blog and my luck to finally have an easy Red Velvet cake recipe and watched how to make. Definitely trying this out this weekend. Can I use the same recipe if I want to make them into little cupcakes? i have never made a red velvet because i didnt find an easy enough recipe to try but now that i have seen your show and it looks soooo easy i will try it soon . Mariam, it really is so so easy…please don’t be intimidated by this bright red cake….it will make it into your hand written recipe book! WOW! meat free days are easier with trendy and delicious veg<dishes like Yudhika's mushroom and peas curry! My attempt was such a hit….I served it in toasted pita pockets and a salad…..Double Thumbs up to Sugar n Spice!!! veggie curry in toasted pita pockets….what a lovely idea! I am so so delighted to hear from you….happy cooking! Its wonderful to hear that you enjoyed the cake and I hope it makes it into your private collection of recipes! The fresh cream scone were an absolute treat. But I made them with Buttermilk and they were still delicious. Thank you for this wonderful receipe. It will surely be added to my recipe book for my daughter to use when she gets older. next step Yudhika..your own little coffee shop or cafe with cooking shows and more awesome recipes. red velvet cake is a must have. Hello there, Working on my next plan at the moment….its going to be fab! Thanks! you can say that again….chocolate brownies…nuff said! No coment on any receipe. Would like to try a chicken and prawn curry in the new Whirlpool microwave oven. Congrats Kriv Pillay on winning the Jet Chef!!! Quick and Easy might sound a little cliched but it is really my cooking motto…I hope you enjoyed the brownies as much as we did! The Thai Prawn Curry recipe seems to be tantalising and do-able. Most recipes on food channels are complicated, expensive and have ingredients that not easily avalible in our local supermarkets. The recipe is simple and affordable. i just watched her making the egg less brownies and i will most certainly try it out. looks very easy and simple ingredients. The “Chocolate Brownie with cream” recipe was really awesome. There are numerous cooking shows with several different recipes, but this turned out to be the best, the quantity of the ingredients mentioned was mentioned very correct and exact, due to which the delicacy turned out to be amazing. My hubby liked it a lot and i recieved a lot of appreciation from many of my friends as well. Thanks a lot the wonderful recipe, i myself am fond of chocolate recipes a lot. Thanks once again. The red velvet cake sounds yummy.I’m gonna give it a try. Chocolate brownies was amazing. Judging by the taste, the recipe had just the right mix of ingredients and surprisingly simple. Respects!!!! Thanks so much for the feedback…I am delighted that you enjoyed the brownie recipe! Wow! The brownie recipe definitely is a favourite of mine, with good quality Lindt chocolate and pecan nuts you cant go wrong. Lindt and pecans..you cant go wrong! Today I felt brave……considering I’m no baking tannie (the best i can bake are “rock” cakes)…lol,I tried the choc brownies that You made on Sugar n Spice,Yudhika. Phew….was i relieved!! !……the result was a yummy and delicious treat! I love the almond and elachi biscuts. LoL jenny….I will try to post a few more veggie recipes on the blog! I love my new Jo Borkett wardrobe….such a treat! Yudhika I added this recipe of yours to my recipe folder last year, but haven’t made them yet as I haven’t found the cardamom essence. Of course I should have asked you ages ago! where are you based, Jenny? Greenside East Jhb. I usually shop for spices in Fordsburg, but keep forgetting to look out for cardamom essence. Try akhalwayas in fordsburg…tel 011 8392113 and speak to Shereen….lovely lady…know her for over ten years! You just have to get some…its a must have for the Naan Khatay! Thanks so much, I know the spice shop, so will try them for cardamom essence when I next go down to them. Hands down the red velvet cake. Jakes use to like carrot cake! Not anymore, now it’s ‘Yudhika’s Red Velvet Cake’! good luck, adam…hope you enjoy the cake as much as the saffron team and I did! I am definitely going to try the prawn curry with penne recipe! It looks divine! Never thought of making prawn curry with pasta before!!! Excellent idea! The chocolate Brownies is to die for…. enjoyed it so much. The chocolate egg less brownies was amazing yummy yum yum. Its was such a hit I didn’t have time to arrange on a platter. Lol. Thanks for the recipe. ooohhh that Greek Lamb pilaau….left me drooling!!! I have to try it & fingers crossed,it turns out exactly like yours Yudhika. I just think that the easy Sugar and Spice recipes are superb.Especially the eggless chocolate brownies that I made. But never attempted to make it until now. Thanks so much for catering for vegetarians on your program, i wish you could sell those gorgeous eggless brownies to the Panarottis, Spurs and Milky lanes of this world then i could enjoy them everywhere! I watched your show on SaffronTV on Sunday 24/02/2013 for the first time and luved the show. I’ve become your fan. I will try your receipes during weekends as I am a working mum. The receipes are so easy and believe me I am going to became the best cook with your help. Luv your recipes .so easy and can be done in a flash.especially your vegetarian dishes .my hubby is a vegetarian n he enjoys it.even my kids luv it.thnk u sooo much . Trying to get my kids to eat spinach, so i am definitly going to try your chicken and spinach recipe. I am sure it will be a success and they will love it. the messy chocolate was lots of fun. the kids enjoyed layering the cake with marvelous toppings! Chocolate Volcanos! I think it must be like chocolate heaven. Chocolate, my favourite every time!! Garlic Prawns love them, so lovely. Brinjals in Coconut Sauce- rich creamy smooth, as a meat eating male I was somewhat apprehensive about this – but wow, it is now a firm family favorite! This was my first attempt with Brinjals and it will not be my last – thanks for a great show we look forward to watching it for years to come! I loved the Moroccan Calamari that you made , looked so easy and with all the ingredients that’s not too difficult to get. Calamari is always so bland and boring when we eat it at restaurants and your recipe gave it such a lovely colour and it is spicy. Thanks I’m trying that recipe in the weekend, and will surprise that over critical husband of mine. The Greek Lamb Pilau sounds interesting … never had Pilau with Feta before. Definitely a must. This recipe is quick and easy and I cant wait to try it. I loved the Pecan and Date Cake you made. I also noticed that you do not over mix when baking which is something I really need to try. I am always buying cakes because my cakes don’t always come out right. Thank you for sharing your recipes as it inspires me to try new things. Date and pecan cake…great as a teatime treat or as dessert with a dollop of cream. The show is easy to follow. It shows cooking is enjoyable and not a chore. Quick and easy curry receipes. They look so simple, makes you want to try them. After a hard day, you want simple and less strenuous work. HI there….we had a chicken dish and the lamb rogan josh for dinner last night! I did leave out the cream…trying to squeeze myself into a bikini for our Thailand/Vietnam holiday which begins tomorrow. The Rogan Josh was spicier without the cream but still so delicious! Love the exotic spanish style chicken. Hint of Catalonia infused with mystical spices with a dash of vibrant crimson crispiness. Cant wait to try it! I love flop proof baking – there are no such things as bad bakers….ONLY BAD RECIPES! Don’t give up – I would love to hear about your baking career! The red velvet cake is simple n easy to make,a cake from heaven, just divine. The red velvet cake has a delicious taste.Its a dream come true. Hi, my favourite is the Red Velvet cake. I always thought it was difficult to make this cake but after I watched it being made on your programme, its not that difficult I am going to try this amazing yummy to die for cake. I am also going to impress my friends with my new baking and cooking skills. Thanks a lot for educating me and helping me empower myself. Hey, just caught the show on today and the prawn curry sounds fantastic, will definately try it out. Hi yudhika. watched your show today. Enjoyed you making chicken curry with lentels. Looked mouthwatering and awsome – will definetly try it. Hey, the chicken curry and lentils……YUMMY!! I even tried your messy chocolate cake and it was messy yet DIVINE! The kitchen was once a female domain, in changing times this is no longer more men are involving themselves in this female domain, I am one of them, resently i baked your red velvet cake for a kiddies party, people could not believe it was baked by me, thanks to you for your simple easy flop proof receipe. mmmm just love the Moroccan Chermula Calamari and the Tamarind Fish recipe .Its absolutely divine . I tried it at home and i must say ….it was the best !!!! watched you making chicken and lentils was very easy, hope to cook it soon as it seemed very easy to make, i am sure the curry will be divine. Yummie!the eggless chocolate brownies are to die for!!!!! I cant get enough of it. Red velvet cake – just yummy! Yudhika darling, I have met you on numerous occasions and I think you are the best ingredient in all your cooking. I have tried almost all the recipes in your book and each one seems better than the last I do not think I could even choose a ‘favorite’ one they are ALL yummy to me besides the fact that my husbands mood changes for the best after partaking in one of your glorious spicy dishes!! Hello Susie….thanks for the message and delighted that you have tried out the recipes. I also have too many favourite favourites so its difficult for me to chose one! Spicy dishes cheer me up too….but I am sure that you a part of the recipe to changing his mood!!! Thai Prawn Curry – my all time favourite. Red velvet cake next. Hi, saw your Sugar & Spice show on the home channel on DSTV on Sunday for the first time and taped it. Will definitely be following you on Saffron TV you make cooking quick and easy as we all tend to overcook our food! Hello Iris – So pleased that you caught the show! Yes, we do tend to overcook our food which just ruins the flavour. I look forward to hearing about your curry cooking adventures! Hi there I tried ur red velvet cake and it came out absolutely beautiful.My family were highly impressed with the cake. Love the red velvet cake recipe… it was easy and came out fabulous!! love recipes that are easy to follow and come out perfect evrytime! Use your fingers to rub the butter into the flour and salt. Bring the milk (with a cinnamon stick) to boil on the stove. Add the butter and flour mixture a little bit at a time while stirring. Turn the heat down and let it simmer for 5 to 10 minutes until cooked. Stir regularly. I have baked the red velvet cake for my birthday on the 10th may. It was divine. Being a huge fan of you, I never miss your show. I love all your recipes. My favourite has to be the Messy chocolate cake, I tested the recipe and it came out devine!!! I also love your Lamb rogangosh recipe! I am going to definitely try the Brownie recipe this weekend. Brownies are my son’s fav. Please, please try and have your spices stocked at a Spar in KZN. Your show rocks!! Yudhika the most devine sugar and spice recipe that I truly enjoyed cooking was the layered lamb breyani on Sunday the 26th of May 2013. I followed every step and WHAT an awesome meal served with salad and sambles and tried the Chocolate sponge cake.Mouth watering so if I do win this Jet Chef Microwave it would be given to my eldest which she would use for next year whilst at varsity. You are truly inspiring the younger generation by saying cooking and baking is just simple and just follow each step. Red velvet recipe….a real winner!!! I tried out the Red Velvet Cake and it was awesome.I have my whole family hooked on that cake. It is the tastiest cake I have ever baked. Hats off to the Red Velvet cake. Hey there all, this is so much fun :). I just joined the family today. Looking forward to a great future with you all, God bless! i watched your show for the first time on Saturday and loved it. I have never had or cooked with AMC pots before (cant afford it), but would love to cook in them someday. I am newly married so i need all the recipe tips and help i can get and your show helps alot. I cant bake to save my life but your recipes look so simple. Wonderful show keep those recipes coming. All good things come to those who wait…I had to pay off my pots over the longest period and it took lots of time to build the set! Baking is really quite simple once you ‘chill out’ about it! Hope these recipes gets you baking! The garlic, butter & cream Prawns recipe: This it to die for…absolutely awesome…!!!! Thanks to you Yudhika I was able to impress my lovely wife on her birthday. She is just crazy about prawns, especially the so called “restaurant style”, that is with garlic butter cream and all…done to perfection. I, never thought that I would ever be able to create such a sumptuous and may I add romantic treat at home. But lone-behold, it was when I saw how easily and effortlessly Yudhika made it, I decided to give it a shot as well, using my wife’s AMC sauce pan…It may have not tasted as great as Yudhika’s dish, however, it sure was delicious and I have my wife’s endorsement to prove that. Most of all I did it all by myself,(it was a surprise…) without making such a big mess in the kitchen…or burning anything. PS: I also cleaned up after, much after….yeee ha!!! i love the red velvet cake…i too am a published cookie…Woolworths magazine..the competition was to create different recipes using eggs in different ways and be cooked in under 30 minutes and i was among a few published. I watched your show and how easy you make every cooking session look and the way you prepare everything ….it is just awesome….I wish to be like you….oh and your outfits stunning….I just love your style and everything you do…..
You big flatterer, Nazimeya – love it!! Hi Yudhika, I love your shows and look forward to every episode. You always surprise us with new & delicious recipes. Your recipes are fresh simple and tasty. My favourite recipe’s are the Naan Khataai and the crayfish curry, Yummy. I would love to own the Whirlpool Jet Chef, it looks sooo cool. I love your style of cooking, you are simply brilliant. Keep those recipes coming. Thanks.